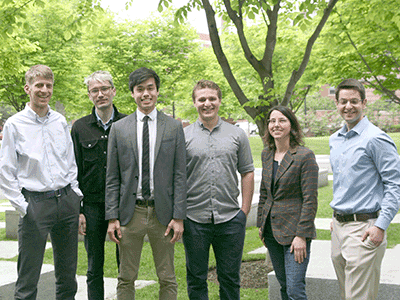 Two MCB concentrators received prizes for their theses this year. Cody He and Caleb Irvine both received Hoopes prizes. Cody He also won the 2016 Lawrence J. Henderson Prize. The Lawrence J. Henderson Prize honors the student who submits the most meritorious thesis to the Board of Tutors in Biochemical Sciences. As a Henderson recipient, He will receive a $500 book award, a framed certificate, and a copy of “Fitness of the Environment” by Professor Lawrence J. Henderson (1878-1942). He conducted his award-winning research in Steve Buratowski’s lab in the Department of Biological Chemistry and Molecular Pharmacology at the Harvard Medical School.